I was recently at the LA Auto Show and had to spend some time at the Porsche display with all the latest and greatest Porsches available. A gentleman beside me noted that this Carrera was one of the finest luxury sports car to date. My first thought was how in the world did a Carrera become a “luxury” sports car? In my eyes the Carrera was never intended to be luxury sports car, it was the stripped down to the bare necessities rally car used in the La Carrera Pan American race that ran from north to south across the Mexico section of the Pan American highway. In the day all the manufactures sponsored cars in the cross country race, Porsche coined the name from the race and uses it in the modern production cars. 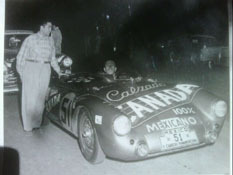 But the origin was a simple purpose built race car with no frills and certainly no luxury. The Carrera’s of today evolved from race cars, but now feature options found in most luxury cars. In keeping with Carrera tradition, you still can only get it with a manual transmission, but please remember where it came from, once upon a time it was a real single seat no frills race car.